This is the actual HeatShield repair of a damaged flue system. Here in Cincinnati, when a chimney liner needs repair, installing HeatShield is a common option. Its used to resurface the chimney liner without having to install a a more expensive stainless steel chimney liner. 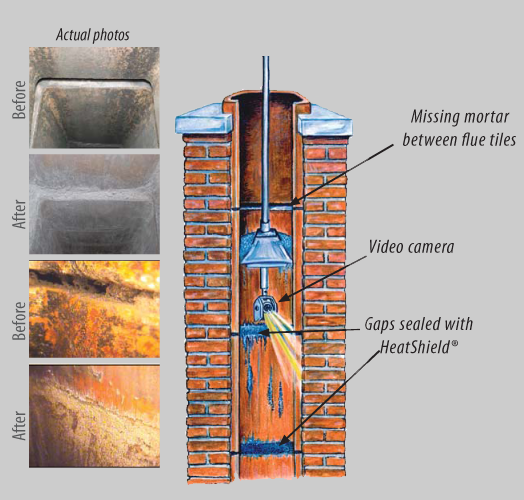 If there are missing mortar joints in the chimney, the HeatShield Joint Repair System can be an option for repair. You have a professional evaluate the integrity of the chimney to see if a HeatShield repair is appropriate. Video inspecting chimneys allows the sweep to examine the entire flue for missing mortar joints and cracked flue tiles. Missing mortar joints are extremely dangerous and can cause chimney fires. It is not up to code to burn a fire in a fireplace with missing mortar joints. If there are loose or open mortar joints the extreme heat from fires in the fireplace can reach combustibles. This can cause a chimney fire to occur. It is very difficult to diagnose whether or not you have missing mortar joints if your chimney professional does not run a video inspection of the flue system. The video inspection will be able to spot missing mortar joints that a professional may miss by doing a visual inspection alone after cleaning. Using HeatShield to completely resurface a chimney flue. Another use of the HeatShield System is to resurface the entire flue system. Here at American Chimney and Masonry in Cincinnati, if we are going to utilize the HeatShield System we will resurface the entire flue system, not just the missing mortar joints. If there are widespread cracks in your flue system, multiple mortar joints are missing, or flue tiles are spalling, your chimney professional may deem HeatShield resurfacing an appropriate repair. The HeatShield System works by attaching a custom-sized foam applicator at the bottom of the chimney. This is so that it pulls up from the bottom to the top. A tie coat is the first coat to we apply to the flue system. It cleans any remaining dust or other debris and prepares the chimney surface for the HeatShield. After this primer is applied, HeatShield Cerfractory Flue Sealant is squeegeed up the flue system as well. The foam insert smooths the material up through the flue system easily using the “slip cast” system. After the material has had a chance to dry another video inspection is run. This is to ensure that the repair is complete and that there are no holes. The repair must be smoke tight. Remember that not all chimney liner repairs are the same. For very severe flue system damage often times a stainless steel liner is the more appropriate option. Chimney repair is not anything to mess around with. Following professional and manufacturer instruction plus local building and fire codes is absolutely necessary. Please visit the HeatShield chimney liner repair website for further information on the HeatShield System.